One would think that President Obama has handlers that advise him on local customs and practices in nations that he visits. And assuming that is true, that raises another question. Does he listen? The admiral seen in this photo greeting Emperor Ahito of Japan is sending a carefully choreographed, if time-worn message to both the Japanese and the American people. The Admiral represents the United States military forces that gave their lives to defeat Japanese emperor-worship during World War II. The Emperor represents the system that they defeated. Note that it is the emperor in the photograph who is bowing slightly in deference to the American admiral, and not the other way around. It was devotion to Emperor Ahito's father, Emperor Hirohito that inspired the fanaticism of the Japanese soldiers at places like Okinawa and Saipan that ultimately led to the decision to nuke Hiroshima and Nagasaki. The cost of overcoming that same fanaticism by invading Japan with conventional forces was estimated at nearly a million US casualties and many times that many civilians. Hirohito sat on Japan's Chrysanthemum Throne as a god from 1926 to 1945. Contemporary revisionist history blames Japan's Imperialism on the Japanese military, but Hirohito was no figurehead. Hirohito personally ratified the proposal by the Japanese army to remove constraints on the treatment of Chinese prisoners. Hirohito specifically authorized the use of chemical weapons on at least 375 occasions against the Chinese. Hirohito personally approved Japan's alliance with Adolf Hitler's Nazi Germany and Mussolini’s Fascist Italy, forming the Axis Powers of WWII. Hirohito authorized the attack on Pearl Harbor and all the atrocities that followed. Hirohito personally chose General Hideki Tojo (hanged by the Allies for war crimes) as his wartime Prime Minister, and was briefed regularly on Japan's military situation right up to the point of surrender. Under Article 4 of Japan's pre-war Constitution, the Emperor was the head of the Empire. Article 6 made him the nation's supreme lawmaker and article 11 named him Commander in Chief of Japanese army and navy. Emperor Hirohito was thus the leader of the Japanese Imperial General Headquarters, just as Adolf Hitler was Fuhrer of the German Reich and supreme commander of the German High Command. Japan did not surrender when the Enola Gay obliterated Hiroshima. Japan did not surrender when Nagasaki was vaporized a few days later. Japanese forces only surrendered when Hirohito told them to lay down their weapons. Nobody else in the Japanese High Command had the authority to order them to surrender except Emperor Hirohito. He had that same authority throughout the war and could have stopped it at any time with a single word. General Douglas MacArthur, who had first-hand experience with Japanese fanatical devotion to the Emperor, thought retaining the Emperor symbolically significant and insisted he be permitted to remain on the throne as a figurehead. MacArthur's decision made Hirohito as a useful partner in getting the Japanese to accept the US occupation. Tactically, it was a brilliant stroke. But many still question whether the price was worth it. Emperor Hirohito was not put on trial, but he was required to explicitly reject the Shinto claim that the Emperor was an incarnate god. And for the rest of his long life, Hirohito escaped any responsibility for the conduct of the Imperial Japanese during World War II, dying of old age in 1989. The American admiral's pictured greeting of Japanese Emperor Ahito set precisely the correct tone, given the circumstances. It showed due respect to the current Emperor of a strong US ally - while acknowledging the American veterans that brought about the defeat of his father's empire. Returning to the issue of President Obama's handlers - they should know all of this. I didn't have to dig very deeply. It takes a willful ignorance to believe that Hirohito was not as guilty of war crimes as either Hitler or Mussolini, despite the official cover-up. With these facts in mind, President Obama's deep bow before Emperor Ahito could only be explained away in one of two possible ways. Either the entire Obama administration team is composed of complete incompetents, or Obama was deliberately sending a message of his own. 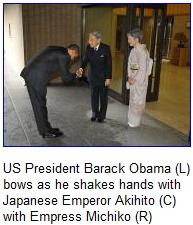 Japanese protocol for bowing is very strict and is scrupulously interpreted by the Japanese people. A Japanese bow, depending on the circumstances and its depth, can say anything from "hello" to "excuse me" - what is significant is the depth of the bow. A typical Japanese bow consists of about a 15-degree tilt. That is approximately the tilt of the bow offered by the emperor in response to the admiral's handshake. A deeper bow is an expression of deep respect, bordering on submission. The bow of 45-degrees offered by President Obama is equal to what Hirohito would have rated from a Japanese Imperial army officer. It was certainly excessive, almost embarrassing, coming from an American president. It reminded me of the deep and reverential bow offered by Obama to King Abdullah of Saudi Arabia, Custodian of the Two Holy Mosques and King of Mecca and Medina. Saudi Arabia is the birthplace, root and branch of the Wahhabi-inspired jihadist strain of militant Islam. Fifteen of nineteen 9/11 hijackers were Saudi nationals, as is Osama bin Laden. Evidence linking members of the Saudi royal family to al-Qaeda is damning and irrefutable. Whether or not King Abdullah is personally funding the Islamic effort to destroy America is irrelevant. As the Saudi King of Mecca, he is a symbol, as inextricably linked to his nation's reputation as is Emperor Ahito of Japan. Ahito as only a little prince during WWII - but both are symbols of efforts to destroy the United States of America. On the other hand is America's legendary alliance with Great Britain, one of the most reliable allies of the American 20th century. When President Obama first met with Prime Minister Gordon Brown, his official gift offered as a token of American friendship was a Wal-Mart DVD collection of old American movies. His official gift to Queen Elizabeth of England was an iPod loaded with his favorite music. Although past American presidents have always carefully followed British royal protocol to the letter, the Obamas threw protocol out the window during that visit. British society was appalled. It was as if the Obamas had studied protocol with the deliberate intention of violating it in as many ways as possible. It appears that the Obama administration's foreign policy theme is one of respect for America's enemies and contempt for her friends. Again, one assumes Obama is following the advice of his handlers, which gives one pause to wonder . . . of all the choices available to the administration - from across the entire spectrum of liberal American intelligentsia - this is the cream of the crop? But assuming that Obama is not necessarily following protocol, but instead is following his own instincts, then what it reveals is a deep-seated contempt for America - together with a shared contempt for America's allies. I can only imagine what the living survivors of the Bataan Death March felt seeing the President of the United States bow low to the son of Emperor Hirohito like a common cooly. They probably felt a lot similar to the way the 9/11 families and survivors felt seeing Obama scrape before King Abdullah. As for how the rest of us felt, I can only speak for myself.